Heat oil in large skillet on medium heat. Add chicken, mushrooms and onions; cook 8 to 10 min. or until chicken is done (170ºF), turning chicken and stirring vegetables after 5 min. 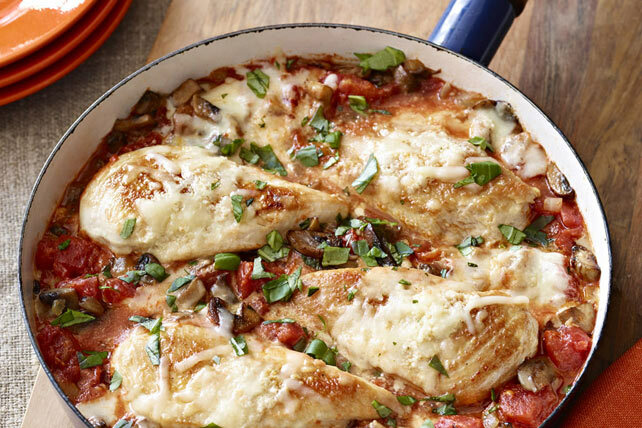 Remove chicken from skillet, reserving vegetables in skillet; cover chicken to keep warm. Add tomatoes to skillet; stir. Cook 5 min. or until heated through, stirring occasionally. Top with chicken. Combine cheeses; sprinkle over chicken. Cover; cook 2 min. or until shredded cheese is melted. Serve with hot cooked rotini pasta, and a crisp green salad tossed with your favourite Kraft Dressing.